The venerated Tote Hotel, Melbourne's favourite venue for Rock and Roll - Loud and Proud. 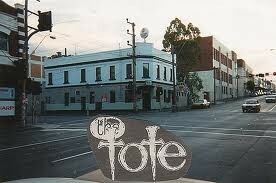 The roster of bands that have played the Tote is long and illustrious. There's not enough space here to even start listing them, if you want to know more then come in and look around as our history is prominently displayed in posters and photos on our walls. Roadie Night "The F*ck F*cks"
New Estate, Fraudband, Jackson Reid Briggs Return Gig!